Why do I need a flat waterstone? Waterstones sharpen very fast because the binder that holds them together breaks down quickly constantly exposing fresh grit. While this results in faster sharpening, it also means that the stone wears relatively quickly and will lose its flatness through continued use. With proper tools and technique, your stone can easily be flattened and provide you with years of quality sharpening. Keeping a waterstone flat is part of regular stone maintenance. Using a stone with a cupped or uneven surface makes keeping a straight cutting edge on a tool such as a chisel or plane blade extremely difficult if not impossible. The best way to make sure your cutting edge is straight is to start with a flat stone. How do I flatten my waterstones? Waterstones are flattened with coarse, flat stones called lapping plates or flattening stones. The process is relatively simple. Step 1: Determine if your waterstone is flat. 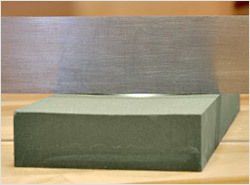 A quality straight edge, engineer's square or combination square is helpful in determining if your stone is flat. Lay the straight edge across the length and width of your stone. If you can see a gap between the edge and the stone, it needs flattening. If a gap isn't visible, try holding it up to a light to be sure. 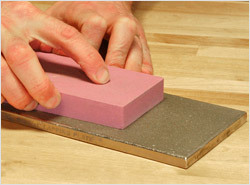 Another method of testing is to try sliding a piece of paper between your straight edge and stone. If the paper is able to slide between them, the stone needs flattening. It is important that you have a true straight edge to test with, a ruler is seldom that flat and a flexible rule is not useful at all for this task. Step 2: Mark your stone. Use a pencil to mark lines on your stone. This is used to determine if your lapping plate has lapped that part of the stone. Once lapped, the pencil marks will quickly wear away. 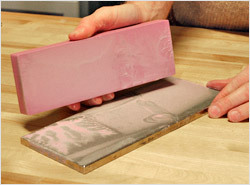 Step 3: Rub the waterstone over the lapping plate or flattening stone. While using plenty of water (running tap water is ideal) move the waterstone over the lapping plate in a random circular motion covering the entire surface of the stone. If running water is not an option, make sure your stones are sufficiently wet. The more water you use the better as it helps wash the abrasive material away. You'll notice the lines disappear from the outside edges of the waterstone first indicating that the middle of the stone is more dished than the perimeter of the stone. Step 4: Check Your Progress. Stop periodically to see if all your pencil marks have worn away. Once the pencil marks are gone, your waterstone is lapped. 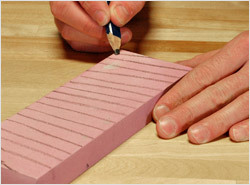 The straight edge used in step one can help determine if you have a perfectly flat stone. Which lapping plate should I use? See the article Selecting a Lapping Plate for Waterstones for help. 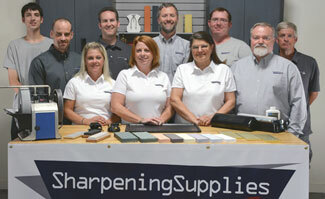 Questions about resurfacing sharpening stones?